Quebec based label Mile End Records joins forces with house hero Darius Syrossian for this latest EP. Montreal based Mile End Records has been a driving force in house music for some time now, releasing music from heavyweights such as D-Formation, Roy Davis Jnr, Angel Moraes etc. 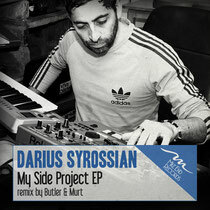 Now the well-respected imprint has teamed up with UK DJ/producer Darius Syrossian for their latest release. Syrossian has been forging his place in the global electronic music scene for almost a decade now, releasing critically acclaimed records on labels such as Steve Lawler’s Viva Music, Heidi's jackathon compilation last summer on Get Physical, 8 bit, Area Remote, and he also had a track on DJ Sneak's Fabric comp this year. As a DJ he has been touring the globe taking his own brand of house music to the world whilst at home he presents a monthly radio show and is looking forward to his debut CD mix compilation this summer as well as his summer Ibiza residency at Sankeys Ibiza every Wednesday at the club alongside Steve Lawler for the VIVa Warriors night. Syrossian’s ‘My Side Project EP’ opens with the title track, a record that has already been picking up heavy support from the likes of Jamie Jones and DJ Sneak, Robert Dietz, Andre Crom, who all enquired about the availably of the track for their own labels. Built around shuffling drums, disco influenced bass and a tight filtered loop this could be an instant floorfiller with its memorable spoken word vocal sample. The second of the original cuts, ‘1994 Session’, sees Syrossian delivering an intense acid fuelled house workout that intersperses tight locked grooves with hypnotic, deep drops. To complete the package Butler & Murt take on remix duties, disassembling ‘1994 Session’ and rebuilding it as a shuffling US style house cut.